The Kootenay Gallery of Art exhibition season opens with two exhibitions. Both exhibitions feature installation art that allows the viewer to be immersed in the art as well as featuring art on the walls. “Fata Morgana” is a major solo exhibition for Nelson artist Hildur Jonasson. It is her artistic response to a residency in the international arctic territory of Svalbard aboard the tall ship, Antigua in the autumn of 2017. The art that Jonasson has produced is ethereal and hauntingly beautiful, similar to the environment she experienced. She brings us on board the voyage through a variety of forms and media – fabric, glass, and ink, among others. 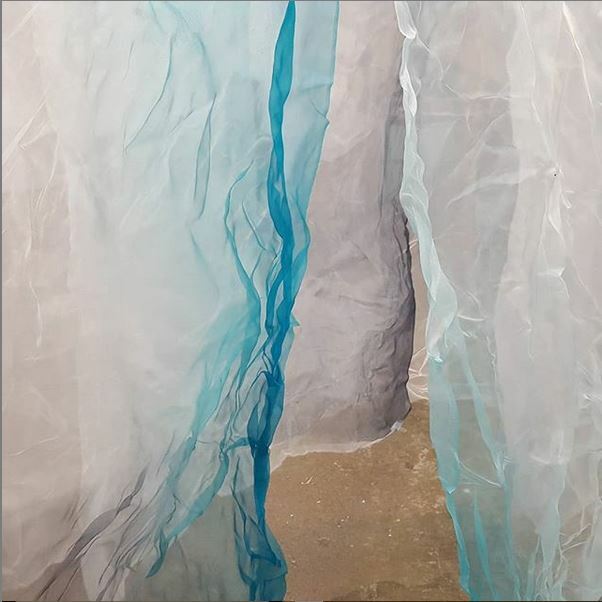 The gallery hopes to feature an artist talk with Jonasson in April about the residency and the work she created in response. Watch for further details. In the West Gallery, Vancouver’s Helena Wadsley has created a series of large three-dimensional drawings that participants will be able to wander around and admire. “Relative to Trees” features a series of these large maple tree portraits as well as several smaller drawing. Wadsley sees trees as a sign of globalization and examines what it means to be, or not to be, of a place. The two exhibitions explore the natural landscape and how it has been impacted by human presence. The exhibitions both open on March 1 at 7 pm. Everyone is welcome to attend this free event at the Gallery. The shows will continue until April 13. The Kootenay Gallery of Art offers a series of exhibitions from March until December. For more information, please contact the Gallery at 250.365.3337 or email us at kootenaygallery@telus.net. Our website is www.kootenaygallery.com. We are open Tuesday to Saturday from 10 – 5 pm. The Gift Shop is free and entry to the exhibitions is free to members and by donation for non-members. We have a monthly e-newsletter that outlines exhibitions of events at the Gallery and in the region. Contact us if you wish to receive our newsletter.